There’s so much more to being a member of Team Bride than dressing up and taking photos. 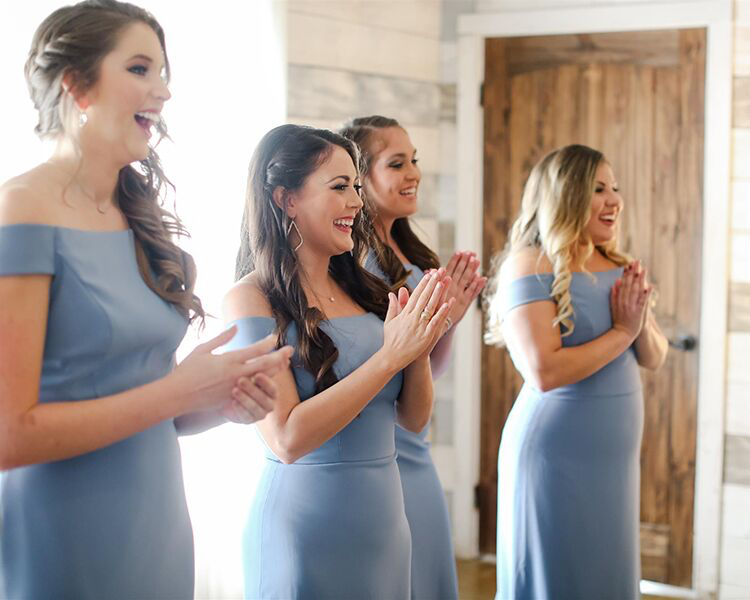 Bridal party members also have to think about the pre-wedding events — there’s the engagement party, the shower and the bachelorette bash — plus gifts, travel, shoes, jewelry and hair and makeup. With all these requirements, it’s no surprise that the average bridesmaid spends nearly $1,700 on her best pal’s nuptials! But if you’re like many, you wouldn’t dream of passing up the chance to stand by her side on her big day, so it’s either dig into the savings or find ways to make it work. The good news is that there are thousands of ways you can stretch your budget to ensure that you’re an enthusiastically engaged — and not broke — member of the bride’s cohort. 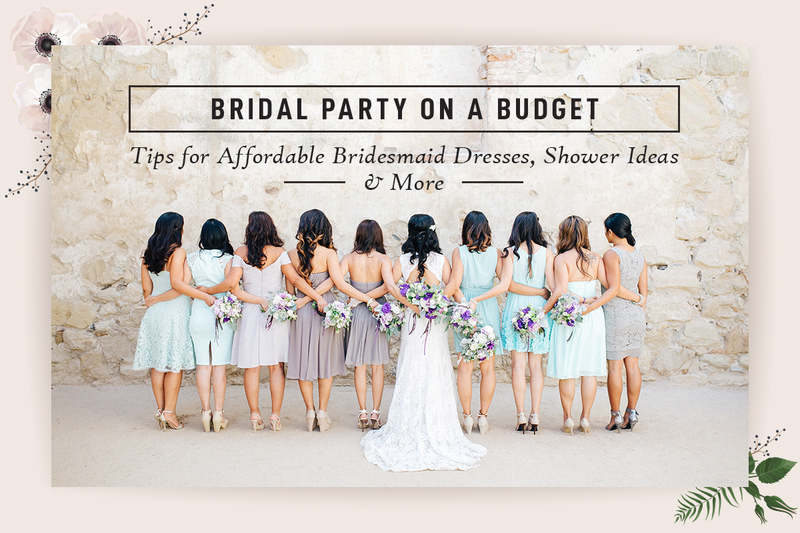 Whether you’re a bridesmaid searching for dresses under $150 (totally doable, by the way) or you’re a maid of honor dreaming of ways to cut costs when planning the shower and bachelorette party, you’ll love these incredible money-saving tips for bridesmaids. Dessy is here to help you stretch every wedding-related dollar as far as it can go this wedding season with zero compromises for you or the bride-to-be. The bridal shower, though optional, is one of the more enjoyable events for members of the bride’s inner circle. It’s typically a relatively laid-back excuse to get together with your closest ladies to sip champagne, open gifts and enjoy each other’s company. 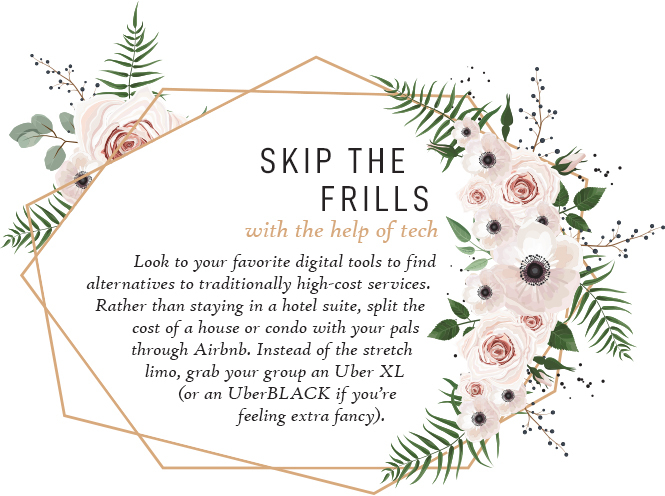 But the bridal shower planning can easily get out of hand, so make sure to reign it in with a few of the following cost-saving efforts. Make DIY Favors and Décor — No big shock here, but did you know that you can save a ton when you opt to make things yourself rather than buying them already made? In fact, putting in a little elbow grease and going the DIY route can save a bride thousands in the grand scheme of things. Wherever possible, scour Pinterest for the best DIY options. In the case of the bridal shower, we’re obsessed with DIY candy boxes, potted plants, treat bags, candles and bath bombs, which are all surprisingly easy to fashion yourself. Have it at Someone’s Home — Ask the bride’s parents, aunts and uncles or grandparents if they’d mind providing the venue for the big day. It may not be as glamorous as a big, fancy event space, but it’ll be much more intimate and special. Bonus: It’s also usually zero dollars. Having the shower at home also allows you to create a more casual, comfortable event with homemade food, which will save you a ton if you enlist the help of the bride’s family for the job. Or Choose a Free Space — If you don’t have access to someone’s home, know that there are a few places that will probably be happy to accommodate your party for free. In many cases, restaurants that have private rooms will happily host your soiree so long as you reach a certain minimum for food and drinks. If you can’t find free, shoot for next to free. Often, you’ll be able to affordably rent out pavilions, shelters or rooms within your public parks system or city facilities. You might be surprised at how lovely these spaces are despite their affordable price tag! 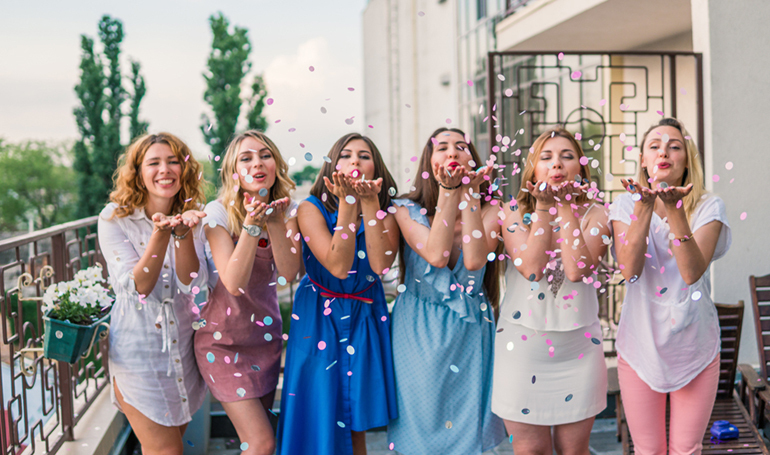 Keep it Just for the Girls and Her Besties — There’s something that feels right about a co-ed bridal shower — the bride’s future spouse and guy friends should be involved too, right? — and it’s fun to bring it to life with nontraditional themes, games and décor. But here’s the downside: Inviting the guys means you double your guest list, which in turn means you double the cost of food, drinks, table and chair rentals and favors. And think of it like this: There are very few events in your life that you get to spend with only your girlfriends. Cherish everyone! 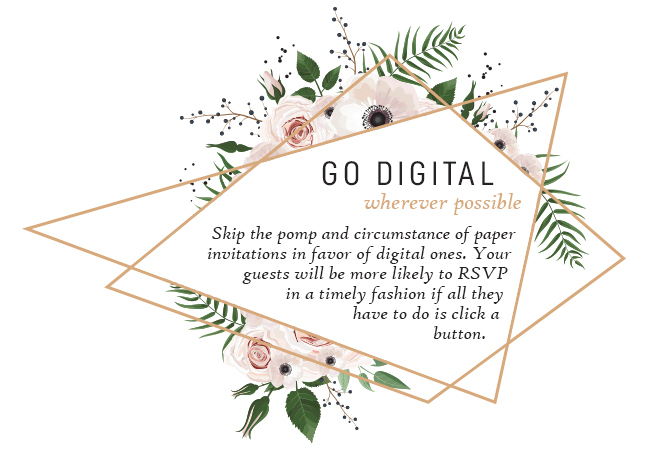 Go Digital Wherever Possible — Skip the pomp and circumstance of paper invitations — which can be quite costly if you have them custom-designed and professionally printed — in favor of digital ones. Your guests will be more likely to RSVP in a timely fashion if all they have to do is click a button, and you’ll save on the design, printing and postage. Check out some of the most popular invitation platforms for ideas. The bachelorette night is the one time in the entire wedding process when it’s not only OK but encouraged to totally cut loose. Thus, it’s often one of the most favorite wedding-related traditions among the bridal party. Luckily, there are some amazing cost-cutting tips you can employ to ensure that the bach bash doesn’t cost the crew more than they bargained for. 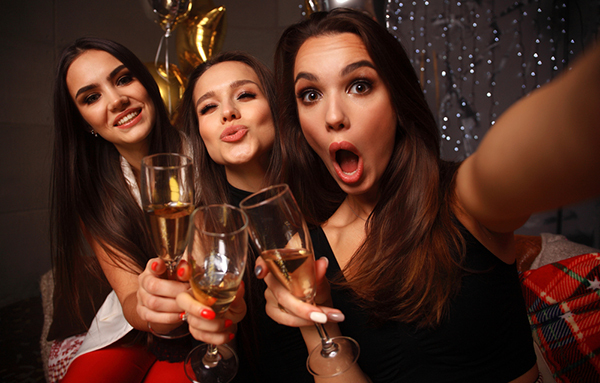 Keep It in Town — As fun as it is to get away with your girlfriends, having a destination bachelorette party really ramps up the cost, especially for the maid of honor who should act as the hostess. When you plan an out-of-town event, you’re also effectively asking some of the attendees to take time off work, leave their families and find child- or pet-care, which could add to the cost. If everyone in the crew is focused on saving dough, keep it in town. You can still create the feeling of a getaway by having a fancy dinner or renting a limo. Why not? Have It at Home — Who says you have to plan a fancy spa day to reap all of that rejuvenating self-care sweetness? Not us! Gather your closest girlfriends, don your bridesmaid robes, crank up the Zen-nest Spotify playlist you can find and you’ll instantly feel like you’re at a spa somewhere far, far away. You can hire student massage therapists, manicurists and estheticians to give you pro-level treatments for a low price. When Penny-Pinching, Book Early — If you’re committed to having her big bachelorette bash out of town or at an extra-special venue, make sure you book at least six months out. When wedding season gets going, event spaces and other wedding-related services get super busy, so they’re not likely to cut you a deal. However, if you get in there early — preferably before these services are even thinking about wedding season — you can often get yourself a discount. If you and your besties are students or are able to get some time off, consider booking your bash on a Thursday or Sunday when costs are lower. Skip the Frills with the Help of Tech — Look to your favorite digital tools to find alternatives to traditionally high-cost services. Rather than staying in a laid-out hotel suite, split the cost of a house or condo with your pals through Airbnb. Instead of the stretch limo, grab your group an Uber XL (or an UberBLACK if you’re feeling extra fancy). Don’t forget to consult Groupon or LivingSocial to get serious discounts on hotels, event spaces or party-worthy concerts and special events in your area. Throw Away Nothing — As a young lady who is (presumably) in the prime of her bridesmaid years, know this: You will have many, many uses for that “bridesmaid” or “maid of honor” sash down the road. Offer to gather and store all the party accoutrements — from the novelty temp tats to the bride’s blinged-out goblet — and bust them out every time someone in your group inches towards the aisle. After all, you should only have to buy a single bridal party tiara in your lifetime. Make it last! 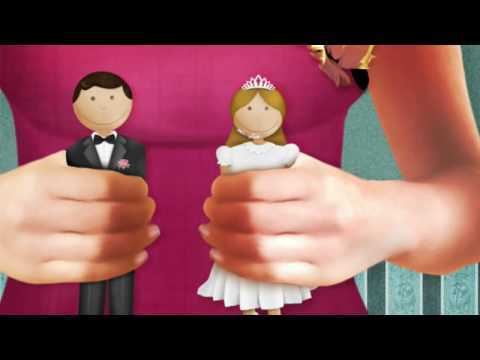 Inevitably, all these soirees lead you to one thing: the wedding! But even though it’s all drawing to a close doesn’t mean that the spending stops. In fact, you’ll need to bust out your wallet (or, who are we kidding, your Venmo app) a few more times before your bestie reaches the altar. Here’s how to make sure your bank account is still well-funded by the time you’ve had your last drink of the night. Vote for Reasonable Bridesmaid Dresses — While the official dress selection will come down to the bride, she will certainly listen to your concerns and understand your budget constraints. To help encourage her to select affordable bridesmaid dresses — like our latest line of gowns under $150! — first get an idea of the style she’s aiming for. Next, find a few budget-friendly options that match her vibe online and send them to her as gentle suggestions. She’ll appreciate that you’re taking the initiative to help lighten her load! Stick to Affordable Accessories — Your wedding accessories might make your look, but they can quickly pile up and weigh down your budget. Rather than blanketing yourself in ice, consider picking one or two statement accessories — a pair of eye-catching shoes or a blinged-out necklace, perhaps — and choose a versatile style that you’ll be able to wear again for your next formal affair. You might also suggest to the bride that she give accessories as her gift to the bridal party so you won’t have to worry about that cost. 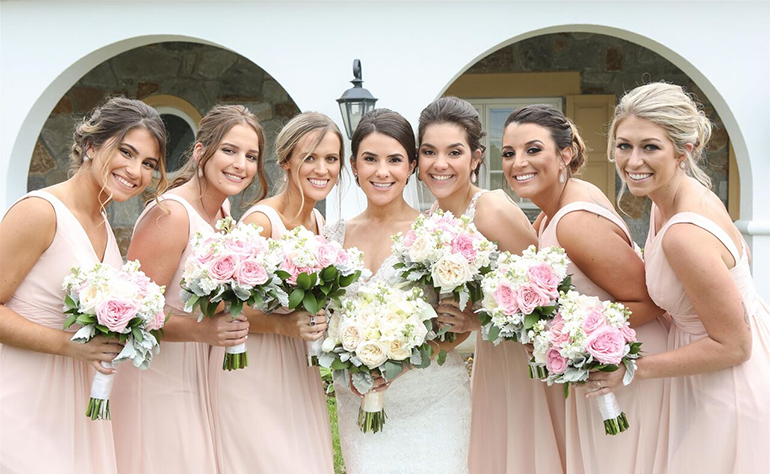 Bunk Up with Other Members of the Bridal Party — If the wedding is out of town, one of the best things you can do early on in the wedding process is get to know all the other bridal party members. When it comes time to plan and attend events, you’ll already have friends and people with whom you can split accommodations, travel and maybe even gifts. Bonus points for the fact that, if you get along well, you may just make a lifelong friend out of the whole affair. Get Creative with Gifts — So with all these events, you might ask yourself: Do I have to bring a gift to all of them? Opinions are split about the bridal party’s gifting obligations, but if you err on the side of the bridal party members giving a gift, get creative wherever possible. Consider going in on a group gift with the rest of the bridal party or creating something DIY that the bride will cherish forever. Remember, the couple will be opening tons of checks and items off their registry, so anything different will be a guaranteed hit. Do Your Own Hair, Makeup and Nails — So long as the bride doesn’t have a super specific vision of what she wants you to do for hair, makeup and manicures, this is another avenue where you can take the DIY route. If you don’t feel comfortable doing your own, there’s a good chance there’s someone in the bridal party who is, so don’t be afraid to ask for help. Just make sure you have a solid plan in place so that you’re not stressed out — or stressing others out — on the day of the wedding. One of the biggest mistakes a bridesmaid can make is not speaking up when she feels that her budget is being stretched too thin. Chances are, if she’s a good friend, the bride will do her best to help ensure that her big day doesn’t put you in the poorhouse. And now that there are more cute and affordable bridesmaids dresses than ever before, plus a wide range of cost-cutting apps and services, there’s no reason you can’t be the best bridesmaid ever while saving a little dough along the way. Just remember one thing: Always suggest Dessy to the bride-to-be who wants max style without maxing out her bridesmaids!